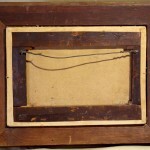 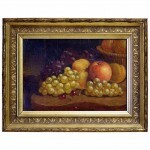 A very competently painted unsigned little still life oil on canvas in what appears to be its original frame. 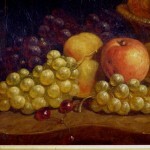 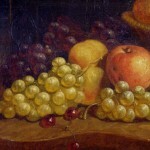 An apple, bunches of grapes, peaches and three cherries sit on a cutting board or a serpentine top table with a trace of a late evening mountainous landscape at the left. 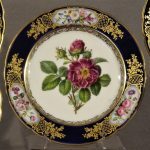 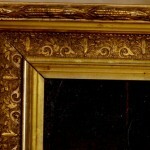 The gilding on the frame is in remarkable good condition for its age. Frame - Height: 13.75" Width: 17.5" Depth: 2.25"
Sight - H: 8.5" W 12.5".